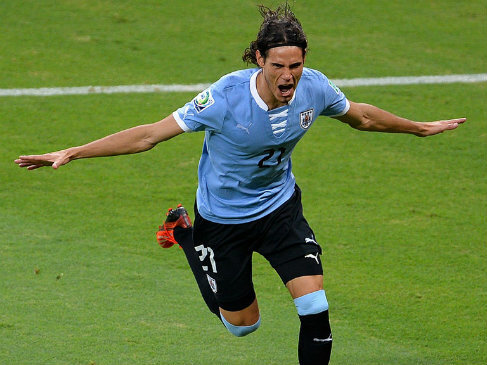 Liverpool are eyeing a shock swoop for Arsenal and Manchester United target Edinson Cavani as Jurgen Klopp looks to bring in a new striker this summer, according to the Express. Cavani has long been linked with a move to the Premier League and a number of clubs reportedly missed out on his signature when he joined Paris Saint-Germain from Napoli in the summer of 2013. The Uruguayan international has continued to impress in France over the past three years and scored 25 goals in all competitions to help the Ligue 1 giants secure yet another domestic treble last season. However, speculation has constantly linked Cavani with a move to England and the rumour mill has kicked in to overdrive once again ahead of the summer transfer window with the Express claiming that Liverpool have joined the likes of Arsenal and Manchester United in showing a keen interest in the striker. Gunners boss Arsene Wenger has been frustrated in his attempts to sign Leicester City’s Jamie Vardy this week so there is a chance the Frenchman could turn his attention to long-term target Cavani as he looks to add a potent goal threat to his attack after missing out on the title last season. New United boss Jose Mourinho is set for a busy summer overhauling the squad he’s inherited from Louis van Gaal and a striker to support Marcus Rashford and Anthony Martial is needed now that Wayne Rooney’s future looks to be in a deeper role. Cavani would be the kind of marquee signing United would like but it looks as though they’ll face some stiff competition for his signature as the Express are citing reports coming out of Italy that claim Liverpool have now joined the race. Jurgen Klopp has already brought in three new faces this summer as he looks to put his own stamp on the Liverpool squad and the newspaper suggests that he’s identified Cavani as the new striker he wants to lead the line next season. The Express say that Juventus are also in the hunt but Cavani and his family are believed to favour a move to England leaving Arsenal, Liverpool and United to battle it out over the 29-year-old’s signature. However, will we realistically see the South American come to the Premier League this summer? Cavani is a world class talent so I’d personally be surprise if he agreed to join Liverpool as they are unable to offer him any kind of European football next season while I have my doubts as to whether Wenger would be prepared to pay the kind of money it would take to sign the player. United aren’t in the Champions League, which could hamper their chances, but the Red Devils have the financial power to put together a tempting package for the player so I think Old Trafford is the most likely destination should Cavani come to these shores this summer.